Day games are awful because there’s usually no BP. Weekend games are rough because of all the little kids. Weekend day games are the worst thing ever — yet here I was. 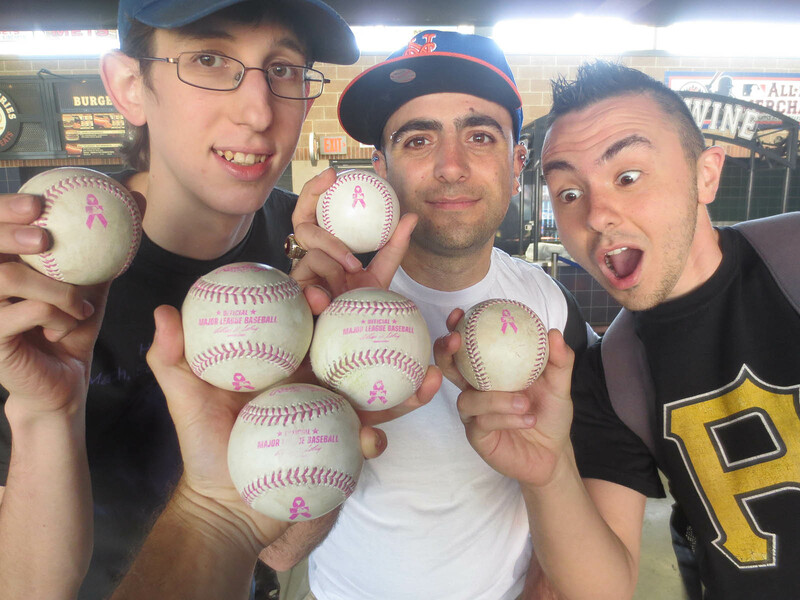 It was Mother’s Day, and I was here for one reason: to snag one of the “pink baseballs” that were supposedly going to be used during the game. I’d heard about these balls from my friend Zach, who runs the website bigleaguebaseballs.com. He’d managed to get his hands on a few of them ahead of time and would’ve sent a photo had I’d asked, but I wanted to be surprised. Were the stitches pink? What about the stamping? Was there a special commemorative logo? Was the cowhide itself tinted pink? I had no idea what to expect. 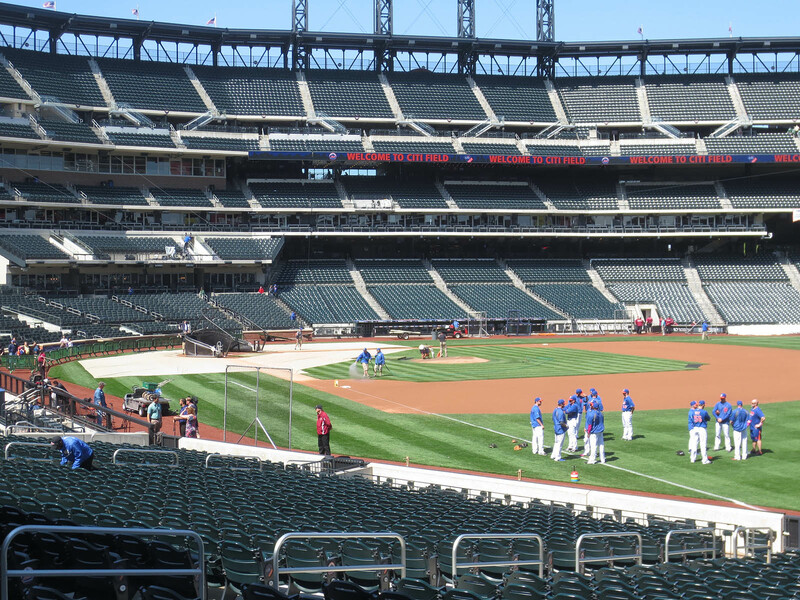 The Mets weren’t yet doing anything — just standing around and BS’ing — but it was a good sign. 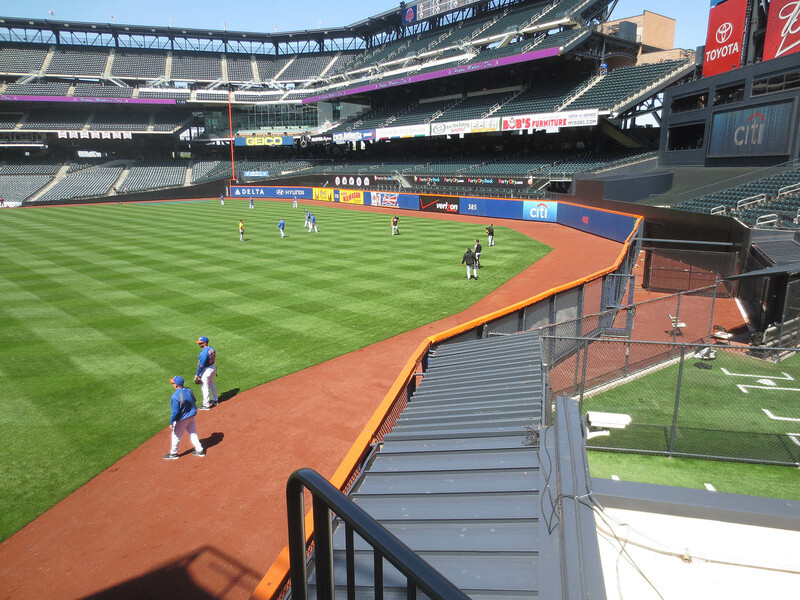 When BP got going, I ran over to left field and promptly got a ball from 3rd base coach Tim Teufel. He was roaming the outfield with a bat, so when he scooped up a ball, I called out and asked him to hit me a fungo. His aim was way off. 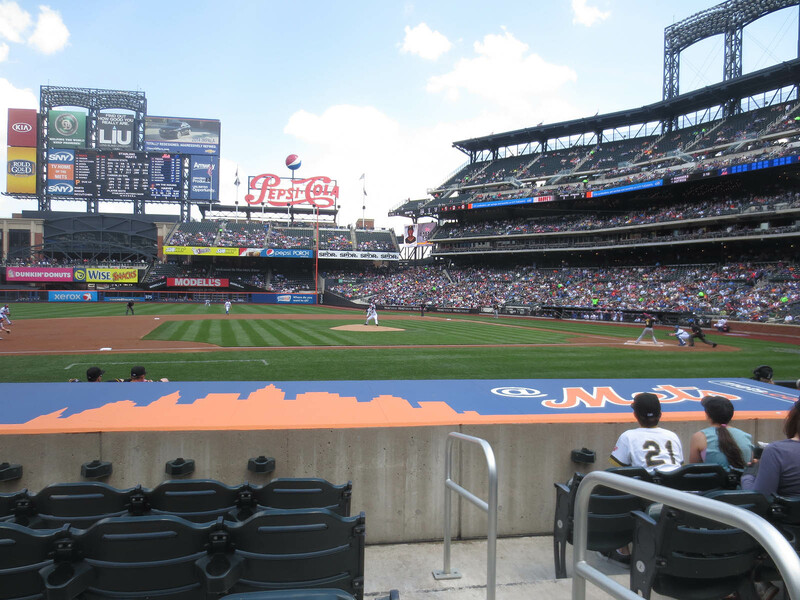 The ball sailed 20 feet over my head, glanced off the facade of the 2nd deck, and plunked down into the seats behind me. I ran up the steps and had a mini-panic attack when I couldn’t find it. What the hell? It’s not like there was an open drain anywhere. The ball couldn’t have disappeared, but it wasn’t anywhere on the ground. Jeez, no wonder I had a hard time finding it. 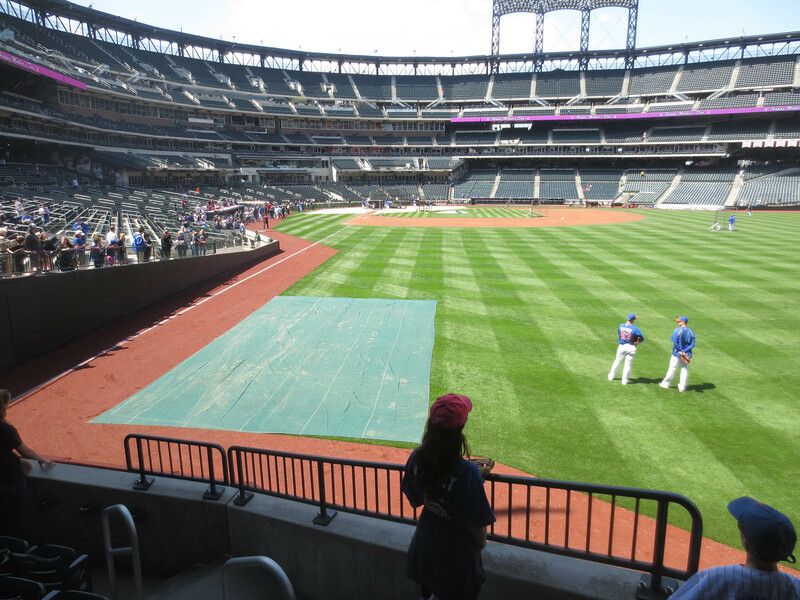 There were several lefties hitting at that point, so I ran back to right field . . .
. . . and got a ball from bullpen catcher Dave Racaniello without asking. “Rac” (as he’s known) has recognized me for years and knows about my baseball collection, and as a result, he’s pretty much stopped adding to it. He’s perfectly nice and always says hello, but in terms of actually giving me baseballs? Not anymore, so I was surprised when he fielded this one, gave it a quick inspection, and chucked it to me. The word “practice” was stamped on the sweet spot, and the whole thing felt a bit soft. “This ball is soft!” I shouted. I wasn’t annoyed, and I wasn’t telling him anything he didn’t know. I was just making conversation. “That’s why I threw it to you!” he yelled back. Two minutes later, I caught a home run on the fly, and five minutes after that, I grabbed another home run ball that landed behind me in the seats. I’m not sure who hit them, but if I had to guess, I’d say Jordany Valdespin and Lucas Duda. Back in left field, Duda threw a decent knuckleball to me, and then I caught a home run on the fly. (No idea who hit it. 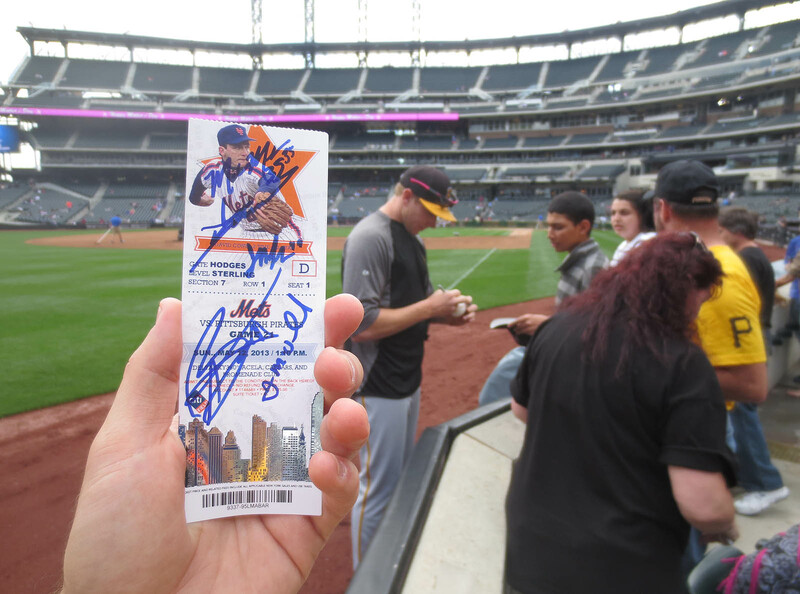 Maybe Anthony Recker?) These were my 6th and 7th balls of the day. All I can say is WOW. The folks at Major League Baseball nailed it. I can’t imagine how they could’ve possibly made this ball look any better — and what a cool idea. 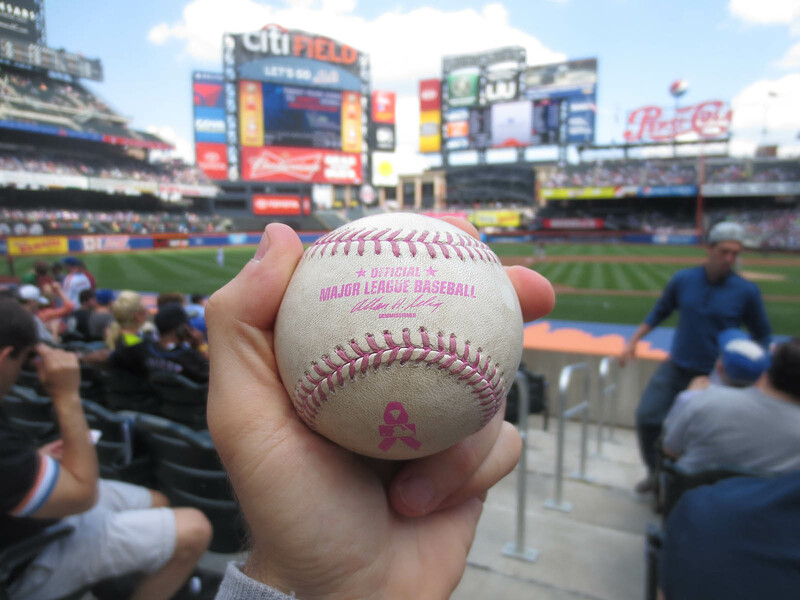 A pink ball for breast cancer awareness? Outstanding. I *really* wanted to snag another, but I didn’t want to hog everything in that section, so I moved two staircases over past the outfield end of the dugout. I would’ve moved one staircase over — that was clearly the next best spot — but my friends Ben Weil and Chris Hernandez were there, and since I already had one, I wanted to stay out of their way. 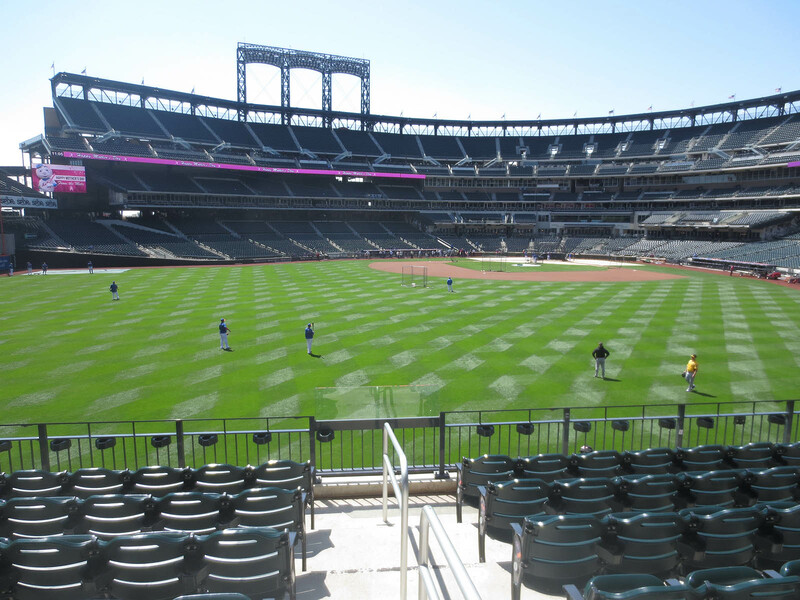 In fact, we’d all agreed beforehand, along with Greg Barasch (who was sitting behind the Mets’ dugout), that we’d all try to make sure that we each got one. If one of us didn’t have one at the end of the game, for example, then we’d let that person take the first shot at getting an umpire ball. I said “almost” because Ben was quick to make an obscene gesture at me from the next section. As you can see, that ball was kinda beat up. I’m almost positive that Jones pulled a switcheroo and tossed me the infield warm-up ball on his way in, but even so, it was still a game-used ball, right? Not only was it mud-rubbed, but these balls were never used during batting practice. 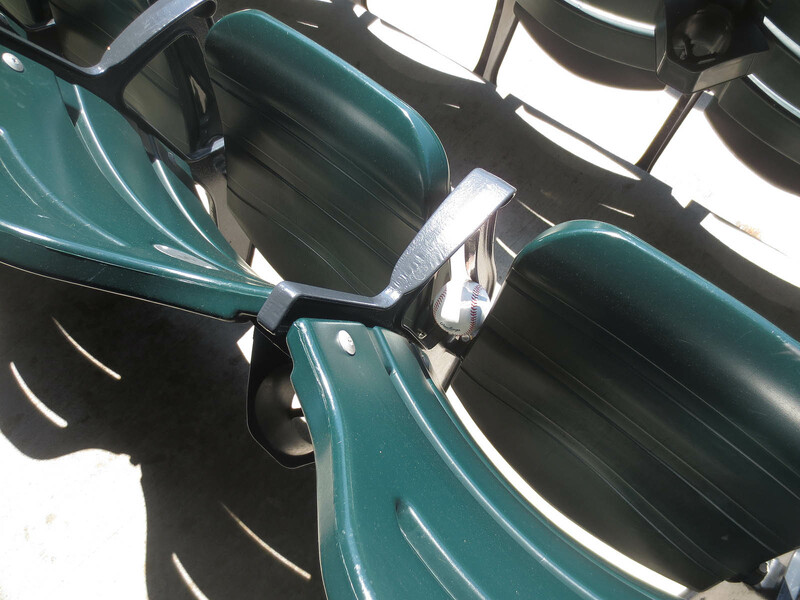 MLB intended for them to be used during games on this day only. I’m not sure who threw it or which ball it was, but I can tell you this: I got it after Daniel Murphy hit a one-out double down the left field line. That ball ended up getting tossed out of play into the Pirates’ dugout, so I walked down to the front row and got the attention of one of the players. I didn’t think he had the ball — I didn’t know who had it at that point — but I still asked him for it. I figured he might be able to get it from one of his coaches or teammates, so why not ask him? Well, it just so happened that he already had a ball (although I don’t think it was THE ball that had been hit for a double), and he tossed it to me. As you can see above, the ball he gave me was grass-stained and scuffed; I’m quite certain that a pristine gamer wouldn’t sustain that amount of wear on one play. 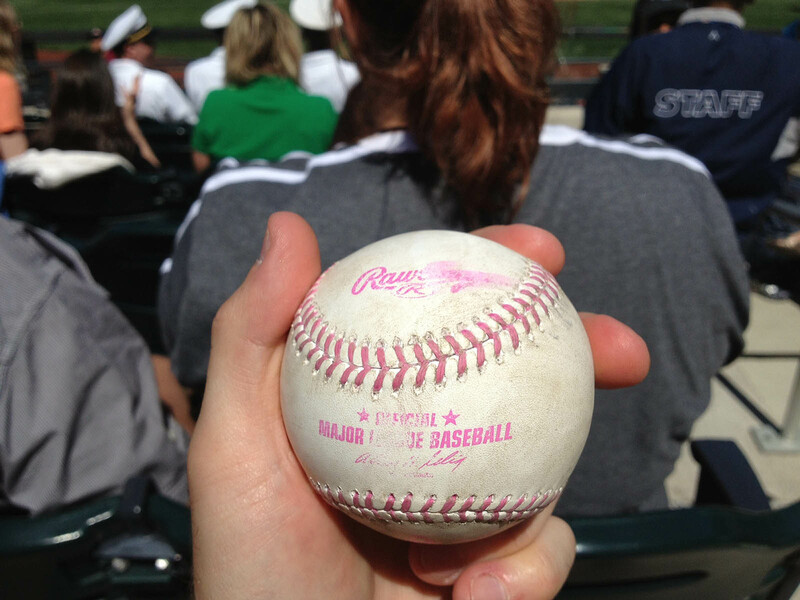 Anyway, the one I got was probably another warm-up ball that *had* been used during the game. 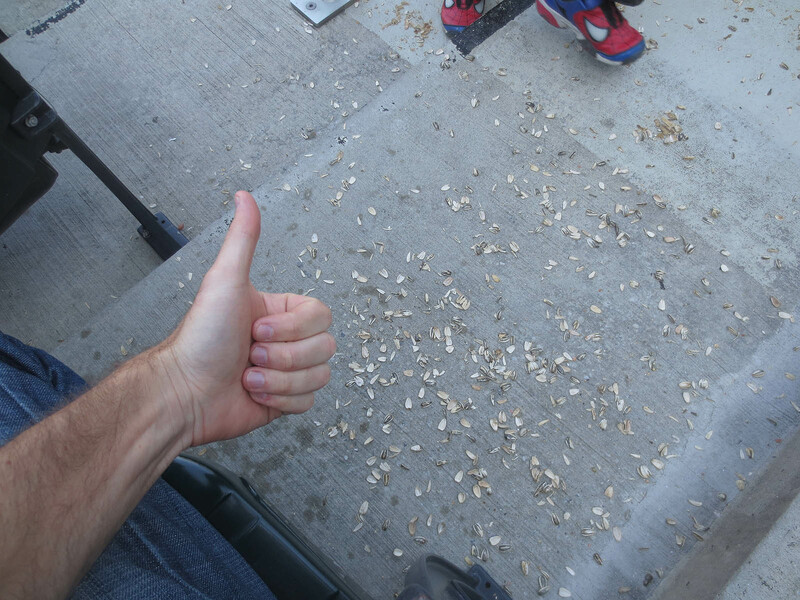 I’m thinking that I’ll give it to BIGS Sunflower Seeds for their end-of-the-season charity auction. I’ve promised to give them a game-used ball from every stadium, so I want to make sure that this one counts as a gamer before I hand it over. What do you think? Matt Harvey had another solid performance — two runs on five hits in seven innings — but had to settle for a no-decision. He came out of the game with the score tied, 2-2; the Pirates took a 3-2 lead in the top of the 8th and held on for the victory. That’s Greg on the left, Ben in the middle, and Chris on the right. Now, if only Major League Baseball would design a special ball for Father’s Day . . .
What is your favorite Bigs flavor? I really thought I had a chance at double digits if the Pirates were hitting. I’m *very* pleased with how my day went though. As for the “switcheroo,” like you said – I’d count it. Balls were made specifically for game use, and they warmed up with it. I’d count it. Essentially, you stole an opportunity away from me by being present and asking Jones for the ball, so you deserved the obscene gesture! All’s well that ends well. I’m really really hoping for a father’s day ball. Nice to see breast cancer awareness is a universal sporting initiative. We have pink days at the cricket and rugby league here in Australia. That said , I wholeheartedly support a fathers day celebration and how about a prostate cancer awareness day ? Being a parent sure gives you perspective. Nice entry Zack. How`s the travel fatigue or have you pushed through the pain barrier ? Probably a tie between Old Bay and Salt & Pepper. What’s yours? Good point. Congrats on your solid day. I *knew* you were going to say that. Heh. I don’t think it’s gonna happen. Maybe next year. I’ve fully recovered from the travel, although I only have a few more days here in NYC to relax. On May 21st, I have an early-morning flight to Chicago, and several days later, I’m already booked for an 8am in-studio interview. That might not sound late to some people, but for me, that’s like the middle of the night. I love the one that was snagged between the seat. Is that the cup holder? 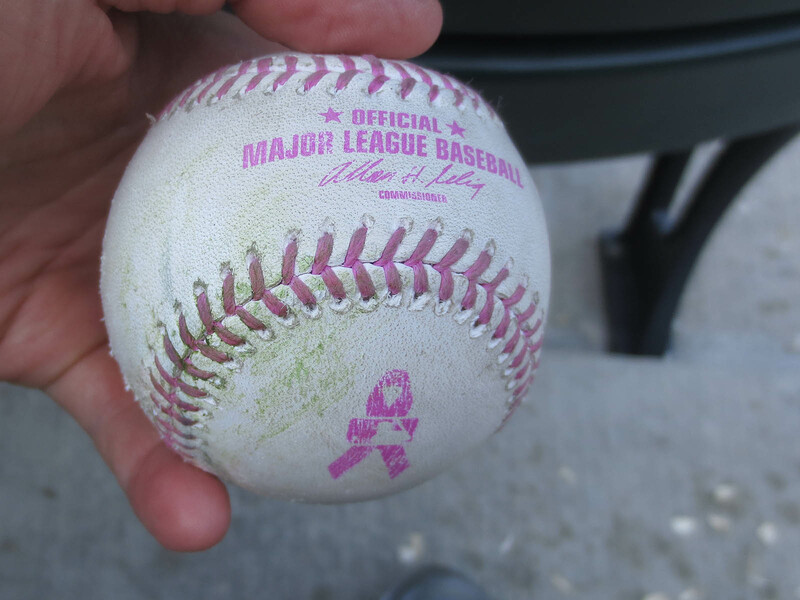 The Mother’s Day breast cancer awareness balls are gems! Always a nice surprise when MLB gets something right. Those are some classy commeratives there. Father’s day? How about a big ol’ Rollie Fingers ‘stache right on the sweet spot. …you guys really CLEANED UP!!! 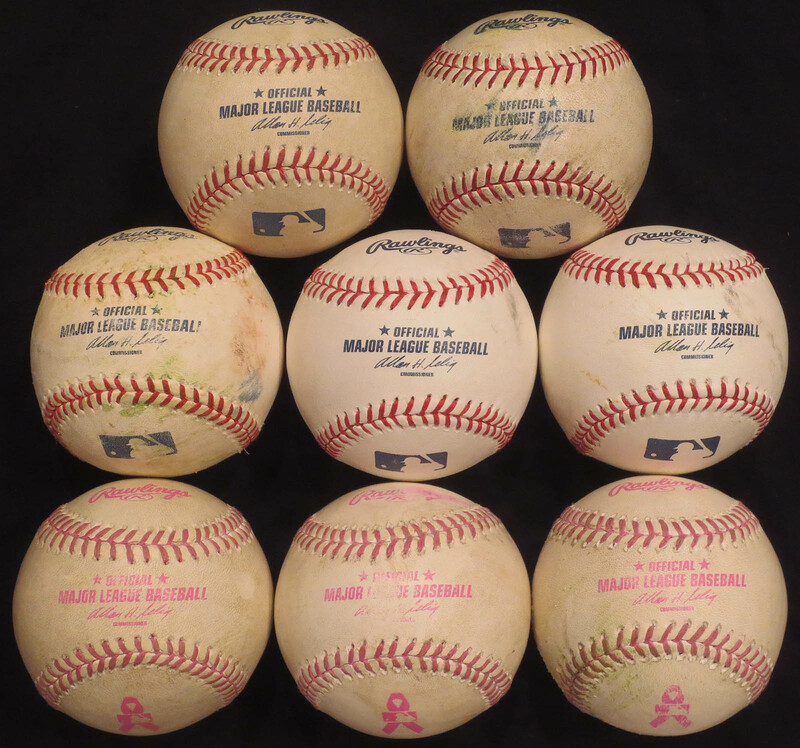 I wish I would of found out about the PINK baseballs ahead of time…I found out while sitting on my couch watching the Reds game…I don’t go to weekend games either!!!!! Hopefully my buddy at the Reds HOF can get me one! Nah, it’s just the random space below the arm rest. Ohhh, man . . . there were lots of people talking about ’em. It wasn’t a secret or anything. Sorry you missed out, but like you said, hopefully your friend can hook you up. Nice meeting you for the first time during BP in Left Field. I didn’t get there right when the gates open because I was coming from Upstate NY, but I avoided a shutout when A.J. Burnett gave me a ball later. Congratulations on the pink Mother’s Day Baseball. Nice meeting you too. Nice job avoiding the shutout. Weekend games are always tough.